Perceptive Automation on Wednesday announced Indigo 3.0, a new version of their home automation software for Mac OS X. Indigo 3 costs $179.95l; version 2.0 users can upgrade for free. A 30-day trial version is available. 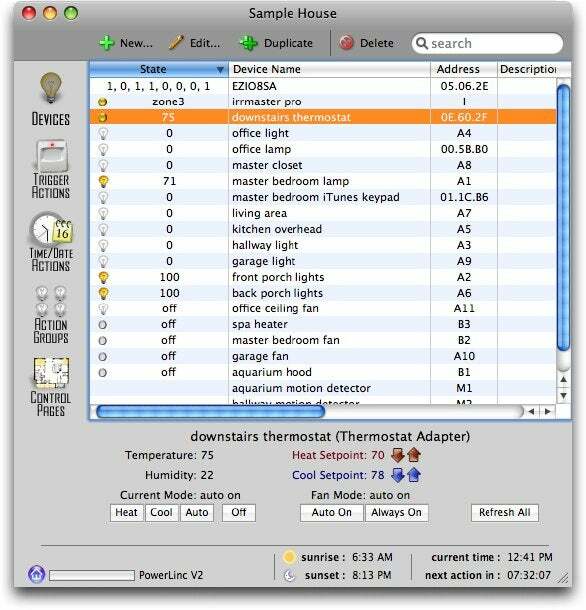 Indigo helps Mac users create and manage home automation systems, controlling lights, appliances, thermostats, lawn sprinklers and other devices. It sports a built-in Web server that lets you control your home remotely over the Internet, as well. You can even use Indigo in conjunction with Salling Clicker and Ovolab Phlink. Indigo 3.0 supports new Insteon-branded home automation devices such as the Insteon Thermostat Adapter, which allows wireless control of Venstar thermostats. A new link and scene management editor lets you define links and lighting scenes between Insteon modules. Indigo can upload logic and schedules to an Insteon PowerLinc 2414U interface, which enables you to complete home automation tasks without having the computer running. Other new features include SQLite and PostgreSQL integration, a plug-in architecture for the Web server, better Web server performance, user interface enhancements, and support for other new Insteon hardware modules. System requirements call for Mac OS X v10.4 or later and compatible Insteon or X10 computer interfaces.